When it comes to making cocktails, rum is a great liquor to mix with just about anything. Of course, it’s also great by itself, but for the purpose of this we’ll stick to mixed drinks. Many people who don’t like the taste of rum prefer flavored rum, such as pineapple rum. With the same or slightly smaller percentage of alcohol, this fruity liquor may have a lighter taste, but it can pack just as much punch. Pineapple rum is just what its name suggests: pineapple flavoring and traditional rum mixed together so the liquor tastes sweeter, fruitier, and less harsh. Pineapple rums taste mainly the same, though there are a variety of brands out. Some prefer certain brands to others. Three of the most popular out there are Malibu Rum, Cruzan, and Captain Morgan. Cruzan tends to be pricier than the rest. Malibu tends to have a lower percentage of alcohol, on the other hand. 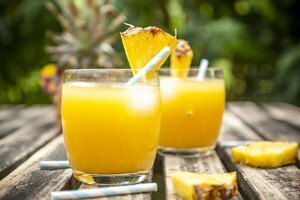 Juice is the perfect nonalcoholic mixture that works well with pineapple rum. 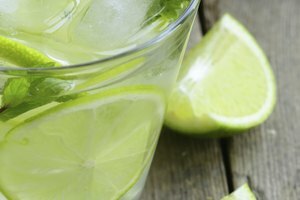 Fruity flavors always tend to go well together, so lemon and lime juice will not generally be a good idea in drinks made with pineapple rum. A popular pineapple rum drink, similar to a hurricane, simply mixes pineapple rum, any form of dark rum, and cherry juice for a dark, decadent cocktail. A recipe for Thai Punch, on the other hand, mixes orange, pineapple, mango, and any other juices one might like with flavored rums, including pineapple rum. Liqueurs are also common ingredients in mixed drinks with pineapple rum. 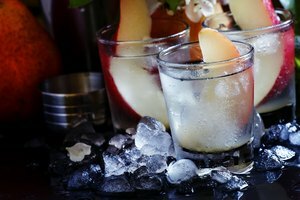 These also add splashes of fruity flavors along with a bit more alcohol to give a drink an extra kick. Blue Curacao is used in one of the rare drinks that include lime juice. This makes a drink, along with pineapple rum, that is both sweet and sour. Witch Doctor, which is a simple cocktail, mixes pineapple rum, Dr. Pepper soda, and Raspberry liqueur together. Soda is often used in cocktails in order to give the drink some added flavor and a bubbly texture that many people like. The Witch Doctor cocktail that was just mentioned uses Dr. Pepper, for example. While it is not common to use lemon or lime juice in cocktails with pineapple rum, lemon-soda, which has a sweeter taste, is often used. Thai Punch, also previously mentioned, uses a splash of lemon-lime soda. The Metnick cocktail also uses this, along with pineapple rum, of course, and orange juice. While all of these things go great with pineapple rum, still more drinks can be made if other liquor is involved. Pineapple rum, dark rum, and cherry juice makes the first cocktail mentioned, which is a slimmed down Hurricane. Pineapple rum is often mixed with vodka as well. Trippin is a cocktail that mixes vodka and pineapple rum, as well as fruit punch, soda, peach liqueur, and grenadine. Captain Red Jack uses Jack Daniel’s whiskey and Captain Morgan pineapple rum specifically and mixes them both with Kool-Aid. This is a great drink to serve as a punch at parties.